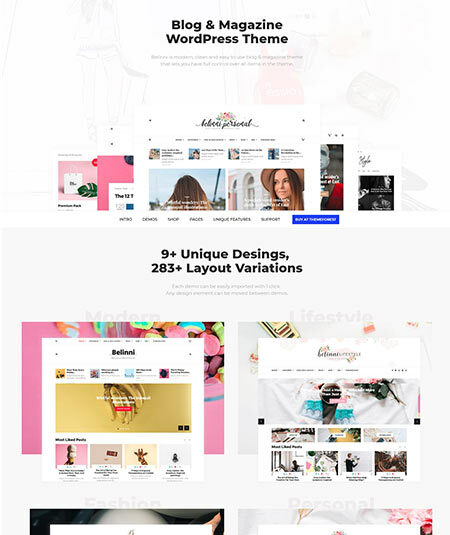 The post is specially for the bloggers who are going to have a personal website or a website about blog and magazine and looking for minimalist WordPress blog themes. 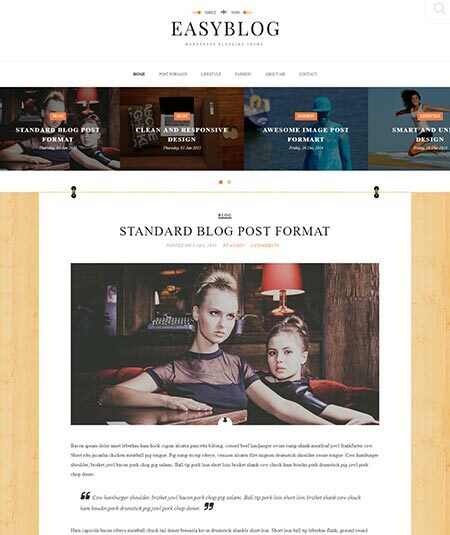 Here we have gathered some amazing and most popular basic blogger templates. Bloggers are getting famous by using an attractive website where they post their content, writes their stories and shares them with the visitors. All those are possible when you have a great theme. The bloggers can check out our collections and they may get their dream theme. How can you find Best Minimalist WordPress Blog Themes for your site? Here are the most wanted themes we have shown in the posts. We uphold all the necessary and important features which are provided by the theme. If you are wishing to set up a shop for selling products you will also get some cool theme with WooCommerce ready. Overall choose the one where you will find the most necessary options you are looking for. So please take a look at our theme. We hope you will find your dream theme. 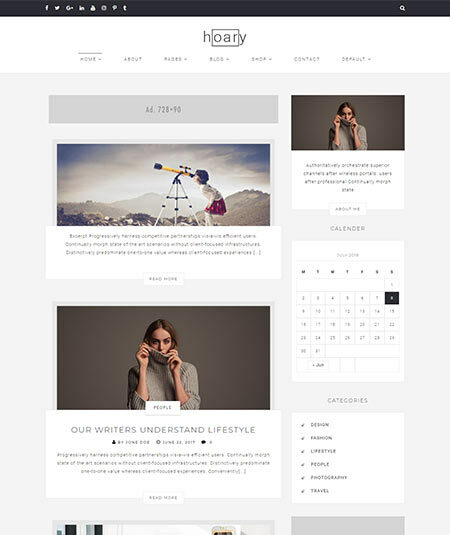 Grace comes with an excellent and one of the best minimalist wordpress blog themes for the bloggers. The theme is fully responsive that means works well in all kind of devices. The theme is full width and boxed also there are two layout styles. Multiple color option is also available. The user can change the colors as their own wishes. From the header to footer there are lots of option where they can change the colors. Some options like tick boxes, select drop downs, text field etc. helps to customize the theme easily. Besides the theme has a very impressive design that looks great on the view of a visitor. It is built with a 12 column grid structure. There are also a good number of widgets. Besides the theme is very easy to set up. 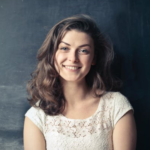 The supporting team is very helpful and always ready to consult about user’s problems. So grace is a very reliable theme for a blogger’s personal website. Hoary is one of the greatest wordpress themes for the bloggers who are looking for a personal website. Hoary provides an amazing design to decorate the website more gorgeously. Hoary has some interesting features. RTL supports, Admin panel, theme option, Bootstrap 3.x, drag and drop builders and many others. These features are great and helps the user to operate the theme easily. This minimal wordpress theme has 4 home pages. Also, pages can be installed just by a single click because one click demo setup is ready in the theme. The work processing of the theme is very fast and users feel flexible with the theme. The theme has some useful shortcodes that are really helpful. Hoary is SEO optimized besides contact from 7 feature is also available in the theme. The theme gives a good support to all its users. So, a blogger can use this one of the best minimalist wordpress blog themes happily. Arate is a modern and clean ghost theme especially for an online journal or for a blogger. This is the theme users can easily operate in any kinds of screen like laptop, desktop or even in mobile devices. 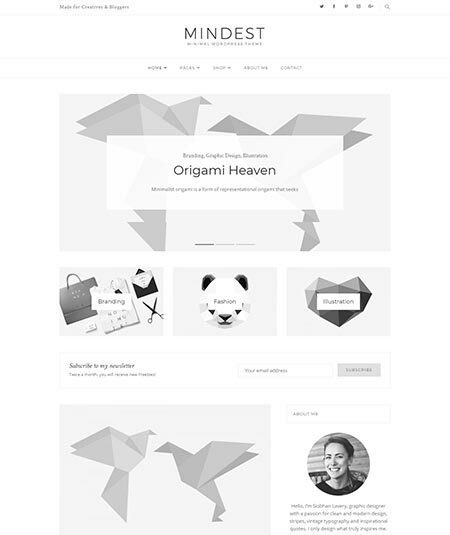 This minimal theme has an excellent design that is really attractive to the visitors. Users can easily setup the themes and other attachments to the theme. The process is very fast of theme so the users can save lots of time using this theme. A lot of features are available in the theme. Valid W3C, valid HTML5, Author cover, next and previous post navigation and many other important features. So the theme is very easy to customize for the users. Besides regular updates are notified to the users. The theme provides the translation support into any languages. Also, they allow sharing posts on facebook, twitter, and google+. The also gives a great service to the users at their regular problems. So a blogger can use Arate very smoothly and flexible. 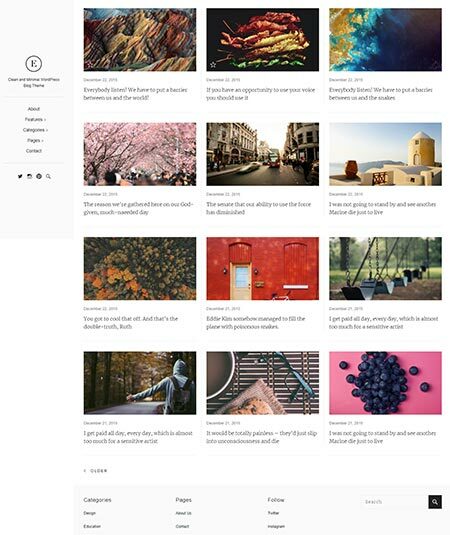 Blogman is a modern and attractive minimal wordpress theme. The theme is highly customizable and lots of features are integrated with the theme. Another thing about the theme is there is no coding knowledge required to control the theme. One must love the features provided by the theme. You will get instagram feed, sticky post, sticky header, newsletter shortcode and many more. With guitenberg editor you can you can configure all the functions smoothly. One click demo installation system is there also saves your time. Besides, it is a fully responsive theme and tested on every device. Such essential plugins like mailchimp, contact from 7, disqus comment etc. are also included to the theme. There are 4 post formats and the theme is WPML ready. Layout options of the theme are also great. The theme provides a premium support. So this minimal wordpress theme is appropriate for you. Typology comes with a text-based minimal wordpress theme crafted for the bloggers. The theme is based on typography and comes with unique designs. Overall with or without image your site will look beautiful. Advanced theme options panel let you set up your theme in just 5 minutes. The theme is also 100% responsive. There are 12 custom shortcodes as well. Woocommerce integration is another feature to select this theme. You can sell various product creating your online store. The theme is RTL supported and WPML ready. One click installation system advantage is also a cool integration. People are always worrying about the fact that how to setup. The theme is providing a setup guide which makes the theme more flexible. And for you any problem their helping team is always ready to provide a proper solution. This one is undoubtedly a cool theme for the bloggers. Matilda comes with a professional lifestyle minimal wordpress theme. The theme can be used for multipurpose. Website about personal blg travel blog, art gallery, photography and others are smoother to create using matilda. Matilda is coded with HTML5 and CSS3. The theme comes with 32 HTML files. There are 8 attractive home versions included with the theme. You will also get a beautiful feature slider with this theme. The theme is fully responsive. In all kinds of devices, it is suitable. There are also 5 different blog layouts. You will also get wordpress customizer. Matilda is a full-width page template. The header and footer are also nice. Social icons stay in header. It is a WPML ready theme and contact from 7 included. The theme supporting team is also skilled and friendly. So, Matilda is a cool minimal theme you can use for multipurpose. Mindest comes with a solution for your upcoming website with a unique minimal wordpress theme. Website such as fashion, photography, portfolio, travel, lifestyle, food and others can be created smoothly with mindest. The theme is based on unyson framework. You will get premade demos with the theme. Happy to know that one click demo installation system is also added with the theme. You just need a single click to setup the theme demo. There are 10+ header layouts. The theme provides the most wanted plugins such as WPML, layer slider, jetpack gravity forms, W3TC and more. It is an SEO optimized theme. You will also get unlimited color and header layouts. The theme is built with HTML5 and CSS3. Woocommerce feature of the theme let you open your online shop. One can easily customize the theme and there you will also a great support from them. Undoubtedly this theme is helpful and flexible for anyone. 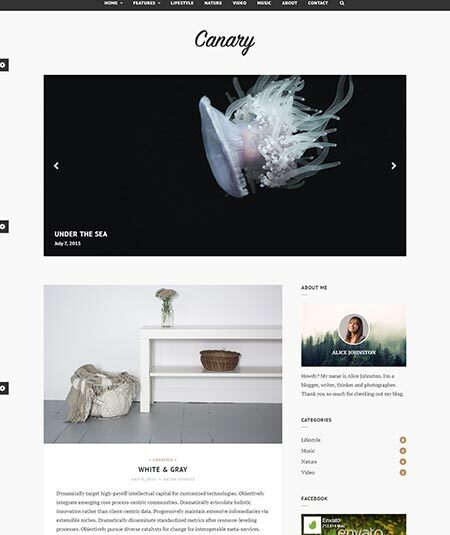 Meet canary a well designed and creative minimal wordpres theme. The theme ha different functions and easy to customize everything. You will get an advanced admin panel powered by redux framework. Multiple layouts such as regular grid, list and mixed layouts you will find on canary. The theme contains a full width logo area. It is also RTL supported. You can share posts with social sharing option. The theme is a translation ready one. So the people from any country get proper support from your theme. If you are willing to arrange social icons you can also arrange from the admin panel. 4 post formats (standard, audio, video gallery) are provided by the theme. If your visitor wants to connect with you they can as there is contact from 7 feature available. Happy to know their customer support is also really impressive. 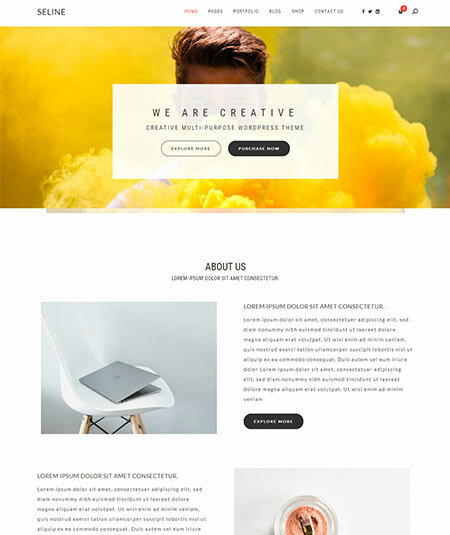 So, this one is a great theme for you to create a website. 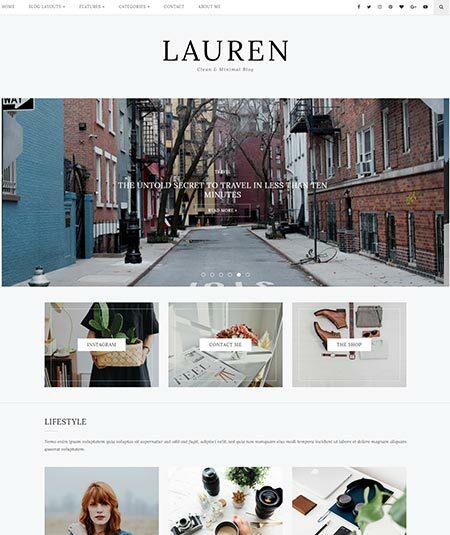 If you are a blogger then you are going to be glad to know that lauren comes with an awesome minimal wordpress theme specially for the bloggers. Any kind of blog like personal, authority, corporate etc. website can be created by lauren. 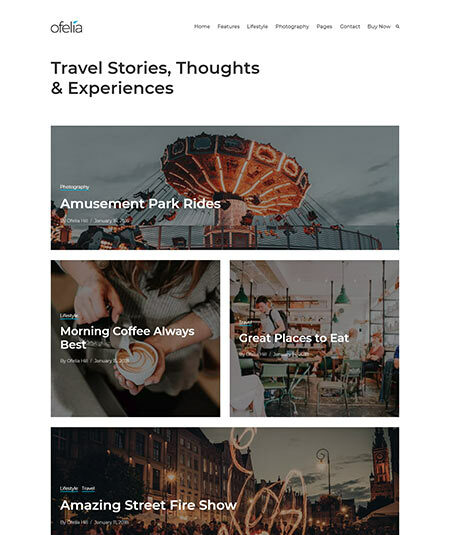 Including list, grid, masonry you will get 10 blog layouts from the theme. The theme is fully responsive. You will get a beautiful layer slider with the theme as well. Inatagram footer option, post slider, about me, contact me and other theme options are also included. Gladly I am saying you that there is a child theme ready with the main theme. Their theme options are powered by wordpres customizer. You will also get a variety of post formats. So, lauren is a good choice if you are a blogger. 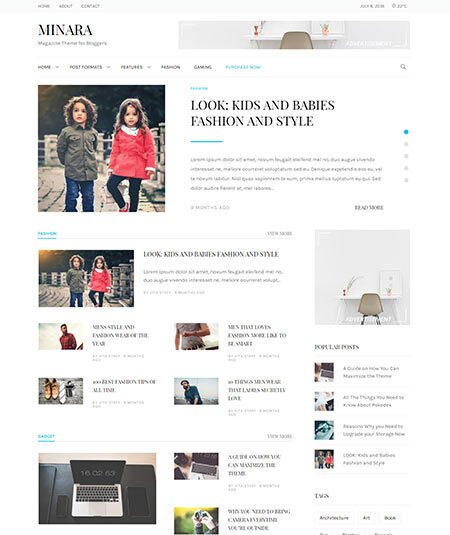 East comes with an attractive minimal wordpress theme suitable for the bloggers. The theme is a mobile friendly and WPML ready theme. They have included lots of options you are gonna love them. Language like Arabic or Hebrew requires RTL feature which is included to the theme. You don’t need to worry about the ranking in search engine. The theme is an SEO optimized theme. Another thing about the theme you will love that they have integrated social media sharing option. For providing a safe modification they are also providing a ready child theme with the main theme pack. You will have this theme as a ready one and which is really easy to install. Contact from 7, custom image logo and many other important features are also included with this theme. So with those functions, this theme is perfect for you. Eskimo is a reliable wordpress theme which is crafted for different kinds of blogs. Besides this can be used to create a website related to photography, shopping, technology and other. In one word it is a multipurpose minimal theme. The theme is providing the best page builder drag and drop builder. It is really easy to build a site with this page builder. There you will also get 8 super easy page builder widgets. Happy to know that you can create unlimited responsive images as there is an attractive gallery. There is also another advantage for you is an online shop. Woocommerce feature is included with the theme that allows you to create the online shop. There are also 700+ google fonts, cross-browser support, time calculator, contact from 7 and many other essential features. They also give you a great help for you any problem. So, this theme is a cool one for you. Blogon is a wordpress theme that is best for the bloggers. This wordpress theme is really smoother and flexible for anyone. No matter you are a professional or a beginner you can easily run this theme and create a cool site. There are 8 post formats added to the theme. Can you imagine there are 7 homepage variations and all of them are attractive. You will get different settings such as page setting, font setting, footer setting and more. Sticky header option is the thing that people love too much. The theme is SEO friendly so you don’t need to worry about your website ranking. You will get lots of pages like about page, contact page, about me. It is ready for wordpress 4.5.x. A child theme is included with the main theme. Overall you will get huge blog settings. So, undoubtedly this theme is gonna be helpful for you. Easyblog is a renowned blog theme for different kinds of blogs. It is almost impossible to describe all the features of the theme. The theme is easy to customize. Powerful theme options have made it more flexible. 3 cool homepage variations of the theme will catch your eye also attract the visitor. There are 2 content layouts as well. The theme is SEO optimized. Two sidebar options are available on the theme with some page options. 404 page, contact page, scroll to top option, about me and other helpful plugins are available. You will have awesome google fonts. Contact from 7 feature let your visitor be connected with you. Finally, you will get a premium support for your any problem. 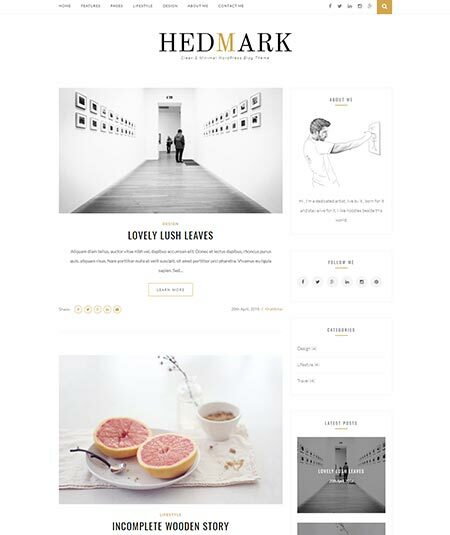 Hedmark is an eye-catching minimal wordpress theme that can be used for different purpose. Especially it is so perfect for blog and magazine. Besides you can create website about publishing travelling and others. One click demo installation system of the theme is awesome. It is a fully responsive and retina ready them. It performed well on all sorts of devices. The theme is based on the latest bootstrap. Minimal footer is also helpful for you. 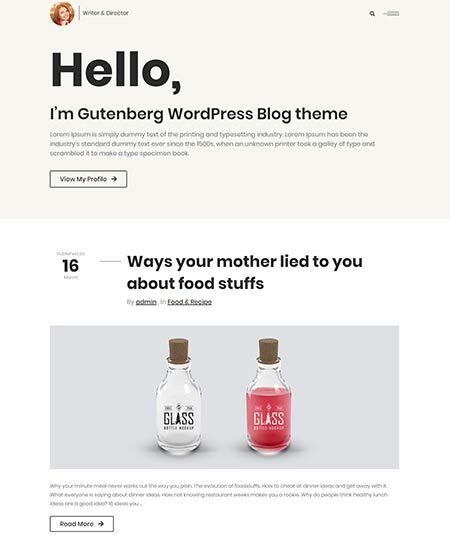 Blog layouts including list, grid and others are also available on the theme. There you get theme building easy functions. Custom widgets like banner ads, about me, latest posts etc. make the theme more useful than others. Different post formats are also provided by them. Considering everything this theme is a good choice for anyone. 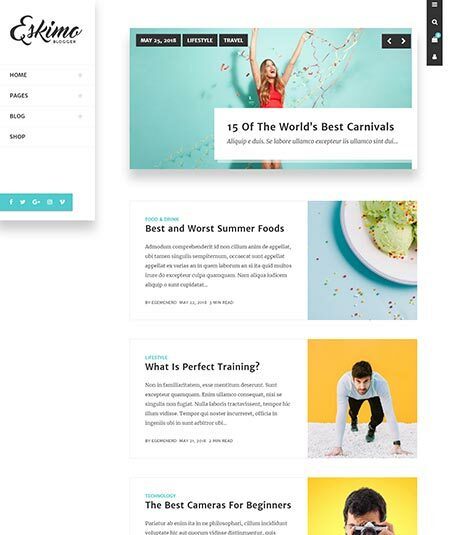 Here meet a great and awesome wordpress blog theme bestblog. One can easily create a blog based website having this theme. They are providing easy customization options and that make the theme more flexible. You will have 3 outstanding homepage variations to select one. An attractive galley can also be created on your site and you can show unlimited responsive photos there. Advanced theme options are also available. You will get layout setting, menu setting, latest carousel setting, post setting and many more. You don’t have to worry about ranking as well as it is SEO friendly. You will get unlimited colour and lots of fonts. So you can decorate your site like your wish. Without these, you will get so many widgets and features and that is really useful. Their support is also high class. So, everything says that it’s really a creative theme. If you are looking for a blog theme then my blog is a good choice for you. The theme is specially created for the bloggers. All kinds of blog website can easily be created with this theme. The theme is a ready and flexible one. It contains 10 different homepage variations which are really a big number. 8 post formats are also included with the theme. 5 contents layouts for the users are added. You will get some cool features and good theme options. Different kind of settings will give you full control over the theme. There are also different page options and custom widgets. As it is a 100% responsive theme visitors from any devices will get a great view of your website. They can also be connected with you as there is contact from 7 feature. There are also so many features and widgets available. So, with knowing the information, you can surely select this theme. 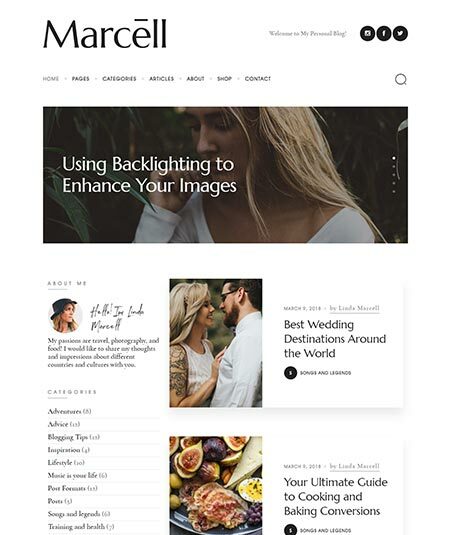 Marcell is an awesome and unique minimal multipurpose wordpress theme. There are so many types of websites can be created with marcell. If you are a writer or blogger then this theme is perfect for you. People always hate a slow loading site. Marcell is providing an extra fast loading website. Installation system of the theme is also easy and fast as well. Some pre-built pages are also theme for you. This theme is fully responsive. Swipe, scroll, views and everything is perfect on all kinds of devices. Great header and footer builder will help you to take full control over the theme. The theme is also an SEO friendly which drags more traffic to your site. Sticky menu and sidebar are also another attractive features of the theme. It is a WPML ready theme. Happy to know that their provides regular update and it is easy to update. Without these are many more functions in the theme. So, surely this one is a profitable theme. If you desire to create the best website about blog or magazine then it is going to come true easily with nubia. 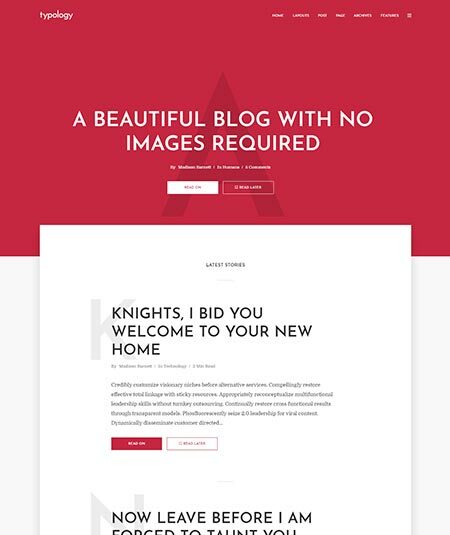 Nubia is a minimal wordpress theme specially for blogs but can be used for multipurpose. Setup a theme is always a fear but happy to know that you need a single click to setup the readymade demo. There you will find ajax posts loading. If you have an instagram account then you can also add instagram feed widget to the sidebar. The theme is RTL supported. Unlimited colours, custom logos and lots of fonts let you able to create the site more attractively. Video responsiveness is also another attraction to the theme. You will also have many other widgets and features. Overall the theme is really great for you. 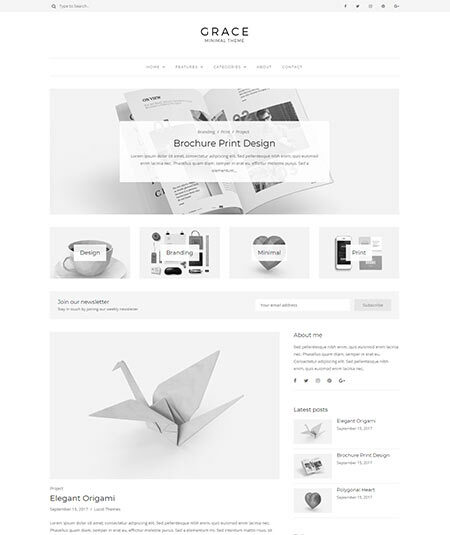 Bone comes with a clean and modern minimal wordpress theme. Blog, magazine, art, business, culture etc. kinds of websites can easily and nicely be created with bone. There you will have the option to select any premade home demos. There you will also get 4 site header layouts, 6 featured block designs and 7 content listing designs. Smart sticky menu is another thing that people and user both love a lot. Social sharing optimized theme is more likely to be as popular as it is. There is also no tension about traffic. It is SEO optimized. Post formats including video, audio, gallery and some others are included. It is built in review system. A good news for you that there is a child theme ready with the main theme. Extensive theme documentation is also added. If you face any problem then you will get help from their skilled team. So, surely it can be you dream minimal theme. Hoary is a clean and great wordpress blog theme that comes with different kind of functions. The theme provides easy and cool features that have made the theme more flexible for the users. 4 premade homepage variations you will get with the theme. Drag and drop page builder is used as the main page builder. The theme also supports RTL. Another advantage of the theme is you don’t have to worry about traffic. The theme SEO optimized. At present most of the people browse a site using phones or mac. The theme is built considering this fact. It is fully responsive. There you will also get contact from 7 feature which allows your visitors to be connected with you. The thing that removes extra hassle of the users is one click demo installation system. It is very easy and quick to set up the demo. Also, lots of shortcodes and custom widgets are included with the theme. The theme is based on bootstrap 3.x. So, hoary is a theme that is the perfect one for you. 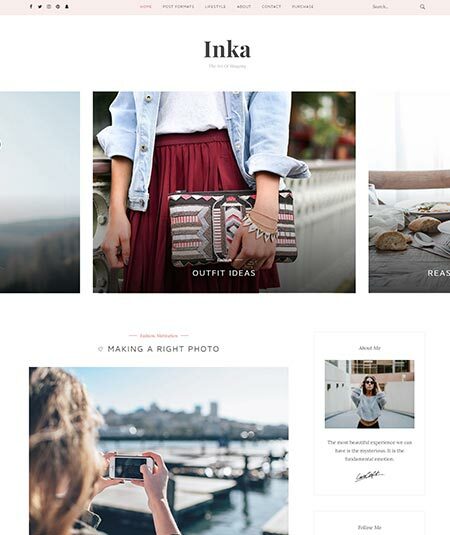 Say hello to inka one of the most popular wordpress blog theme. Websites of different purpose can be created with inka but it is specially crafted for the bloggers. With the help of live customizer, it is really easy to customize the theme. If you have an instagram account you can share those to your website. The theme is also WPML ready. You will also get grid and list layout. Video, audio, gallery and other post formats are also available in the theme. 1 click demo installation system of the theme is also a great advantage for you. The page loading is also faster. There you will get feature slider, typography, back to top options and others. Your visitors can contact you as there is contact from 7 feature. As it is an SEO optimized theme your website will get good traffic. Another thing that is really great is their support. They provide a great support to the users. Overall, this theme is a good one for you. 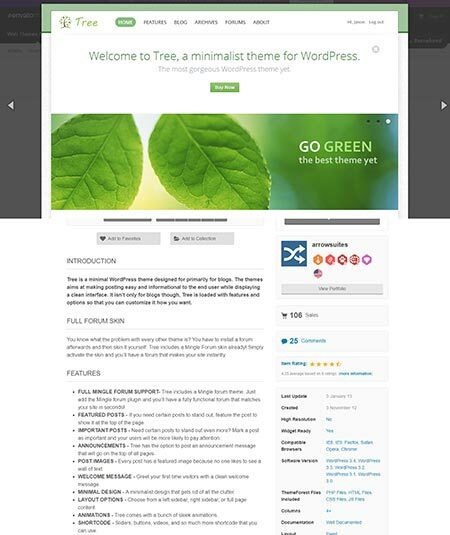 Tree is a cool and unique minimal wordpress theme which is perfect for the bloggers. Tree gives the latest wordpress technology and it is easy to customize the theme. The theme is SEO optimized with proper heading tag. So that ranks up your website in the search engine. It is also cross-browser compatible. No worries about the visitor use the browsers. Animation integration of the theme has made the theme more attractive. Full mingle forum support is another thing to love the theme. After every post you can post images with that as a post without image isn’t so attractive. They are providing lots of shortcodes and essential widgets. They have also a skilled team who are always ready to provide you a premium support. So, after having those information you may not look twice to other themes. Are you willing to create a website for your next blog? Maxima is here with a modern minimal wordpress theme. Maxima is providing lots of theme options and it is easier to design a website with maxima. It’s always a matter of time to import the demo data but you will get one-click installation system. It requires only a click and quick. You will also have the option of social media sharing such as twitter, facebook. You can design your site with custom icons. Responsive video feature let you showcase videos and it is perfect on every device. You can also customize the footer with 4 special widgets. The theme is 100% responsive. So from any types of device, your screen will be shown crispy cool. Without these, there are also so many features. For you any problem they will provide you with a good support as well. So, undoubtedly one can select this theme for making an attractive website. 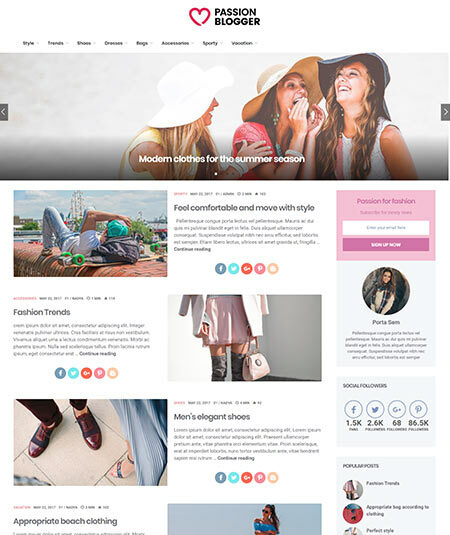 For building any kinds of the website with blog and shop, Minimalo is a minimal clean blogger template. This theme is a very quick loaded theme with lots of attractive options. The have the one click demo importer that is very quick and really east for the user. They also provides 4 unique layouts and 6 unique headers. The headers can be switched to others with just a click. So it’s really easily to customize the theme and run the website. Minimalo provides a lot of features. Post format, sticky sidebar, RTL support, WPML support, instagram and twitter feed and other features are really helpful besides they response to user’s question very fast and friendly. So why are you looking for more when u have got this awesome wordpress theme Minimalo. Bone comes with a minimal and well-designed and one of the best minimalist wordpress blog themes for blog and maganize sites. It has some attractive home demos that attract the visitors to the owner’s website. This basic blogger template has multiple paginations such as standard pagination, ajax loading, infinity scroll, next and previous and others. Also there is an extra child theme included in the theme so the users feel more flexible with this wordpress theme. It’s a responsive blogger template with slider. The theme has a regular update system. It has 4 site header layouts, 6 feature block designs, 7 article page designs, 7 content listing designs, smart sticky menu, and sidebar. So the theme is easy to customize. There are 800 google web fonts and font awesome icon pack that keeps the website more stylish. This modern theme has many features and a great supporting team is always ready to help the users. So if a blogger wants to create a website about blog and or can choose Bone undoubtedly. Ariva is a unique text-based wordpress theme for the bloggers. The theme is fully responsive that means it can works in any types of devices. Besides, it is supported by all kinds of browsers. It has 125+ home pages layouts that mean users get a lot of choices. The theme is very quick setup and very easy to control. There are 3 types of review system star, point, and percentage. Also simple mega menu and sticky slidebar is available in the theme. 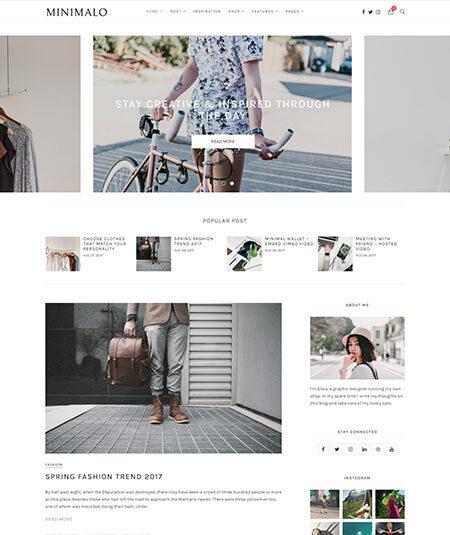 This basic blogger template has ready woocommerce feature. Using this user can sell various product in their website. Regular update is available in the theme. Unlimited color option is also available in the theme. Lots of features are there such as contact form 7, 200+ google fonts, breadcrumb, post social share option, author box and others. They provides a good guidance and support to the users. A blogger looking for a stylish and bright wordpress theme for his website can use koalogger. Koalogger can be used in all kinds of devices such as a laptop, desktop even in mobile. This basic blogger template is very easy to customize and a quick setup system is available. There are 3 post list layouts. 6 post formats (standard, gallery, audio, video, quote, link) are available. The theme has also contact from 7 feature. So these make the user feel flexible with the theme. This theme also supports social links such as Facebook, Instagram, twitter, google+, youtube and many others. Regular update and a friendly support is also provided by this theme. So koalogger is the best solution for a blogger’s wordpress theme for a personal website. Soma is a profitable woocommerce theme especially for them who are going to sell various products via online. 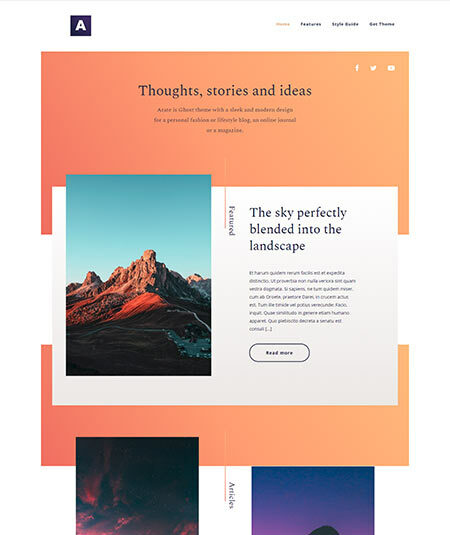 The theme has a very powerful page builder. They provide WPBakery page builder for free. The design of the theme is very charming. Besides the page loading speed is appreciating. The theme ensures a quick setup within just a minute. They accepts many different options for payment. They give a lifetime update advantage. Shipping options are available in this minimalist blogger templates. For this shipping, the theme auto detects the customer’s location via geo-location support. Also, the customers can give their reviews on product on the websites. The users don’t need extra coding knowledge to create a shop. Many important features are included to the theme. Sticky menu, retina ready, WPML ready, digital downloads and others are the main features. The theme is workable on all kinds of display. 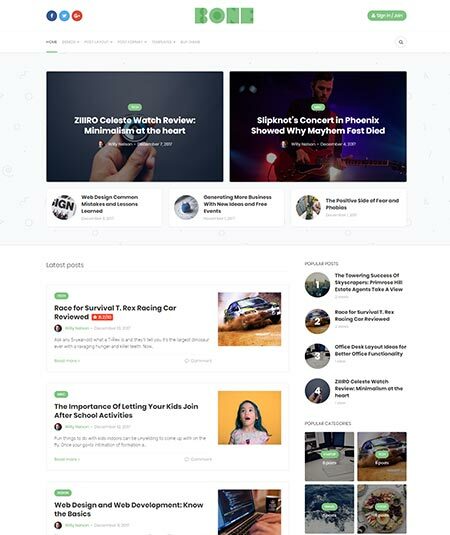 Purism is a great blog and shops wordpress theme for a blogger who is about to make a website about a personal blog or magazine along with a shop. This theme is fully responsive that means works in every device. 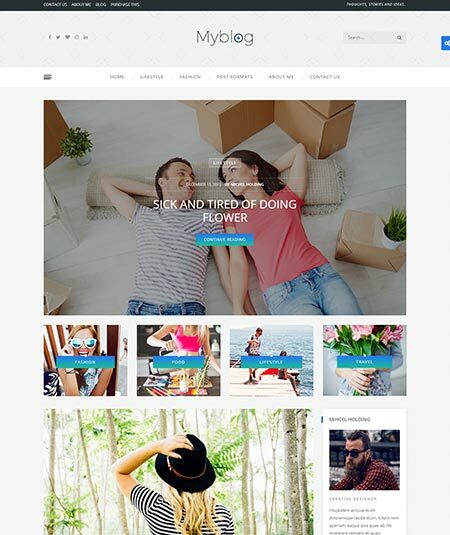 The theme has a great woocommerce system. Using this user can set up a good shop for various products. This theme helps to overview products. The design is very amazing so the customers feel cheerful with the website. This is a responsive blogger template with the slider. Lots of google fonts are available besides unlimited color option to create the website more impressive. 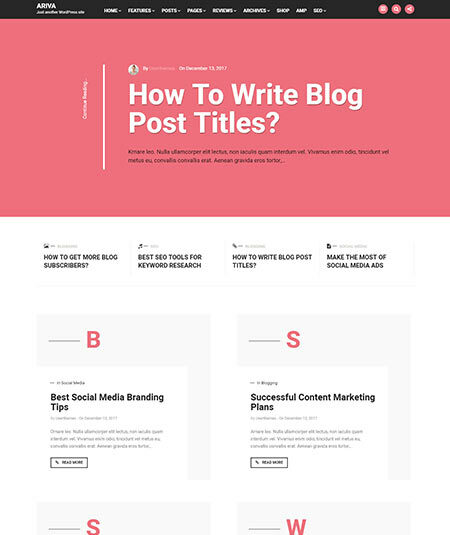 4 post formats are available and 18 blog layouts. 2 simple post templates, boxed and width featured image. Many useful features such as contact form 7, lazy load effect, translation ready, social link widgets, image and gallery lightbox, Instagram feed and others are available in this theme. A reliable supporting team and a regular update is provided by the theme. So a blogger can build a great personal website having this one the greatest minimalist blogger templates. 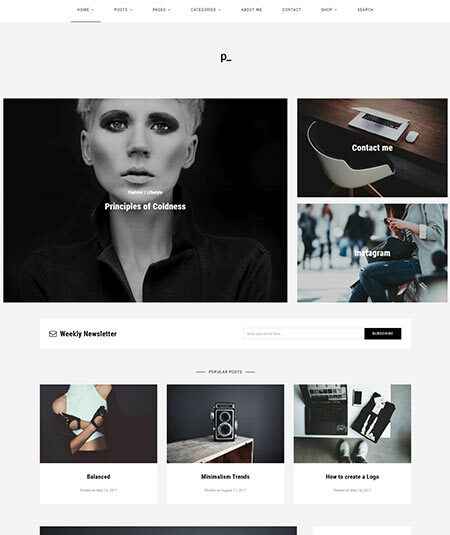 Passion blogger is a minimal wordpress theme for those who needs a personal blog, minimal magazine, or photo blog. The theme is for everyone even for the beginners because the users don’t need any coding knowledge to operate the theme. There are about 100 pre-designed demos for the users. Users can choose any of them like their choice to make their website more attractive to the visitors. There is a build in performance option that makes sure the quick loading and smoothness of the theme. The theme performs well with all kinds of devices. From large to small display it is always flexible. It has different header styles and a flexible footer. 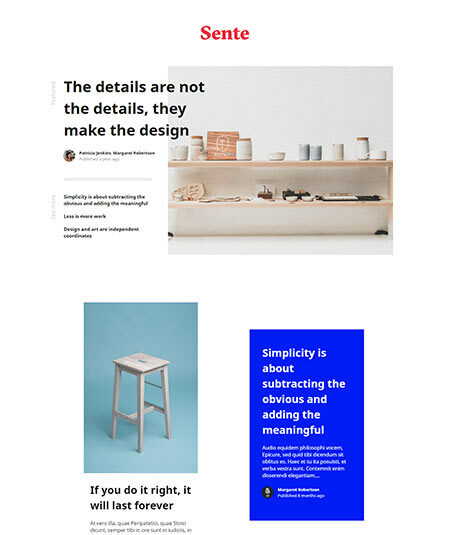 There are about 30+ attractive blog designs for the users. There are 800+ google fonts and this minimal clean blogger template is SEO optimized. 10 premium plugins are also included to the theme and a lot of important features are available in the theme. So passion blogger is a perfect theme for a website about blog and magazine. 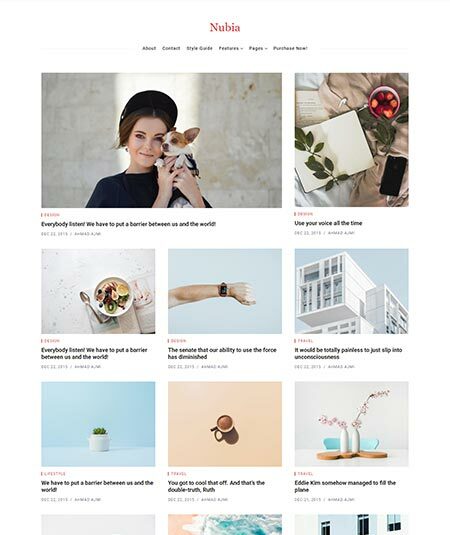 The blogger who is interested in telling or writing stories or about to build a blog website, Ofelia a modern stylish minimal wordpress theme especially comes for them. It’s a fully responsive theme that works in all sorts of displays. There are 700+ google fonts there the users can use as their wishes. The theme is very easy to customize. The theme admin panel helps to add logos, change colors, header, fonts, and others very quickly and easily. There is an extra child theme included in the theme. The theme is also SEO optimized. There are 6 homepage and blog layouts. Regular updates are also provided by the minimalist blogger templates. The design of the theme is supercool. There are a lot of features such as 3 distinct header layout, social media icons, sticky header, Instagram feed, Bootstrap 4, translation ready and many others in this simple blogger templates. This theme gives a reliable support to the users. So a blogger should choose this one of the best simple blogger templates to operate their website perfectly as their wishes. 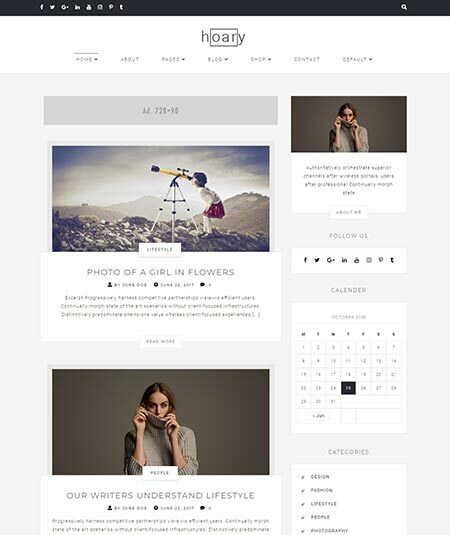 Seline is a highly customized and professional theme for a photographer. The theme is very fast loading and workable in every sort of devices and also supported to all kinds of browsers. The theme has a lot of shortcodes such as google map, top padding, accordion, call to action, grid builder and others. Those shortcodes keep the users flexible with the theme. The users don’t need any coding knowledge to handle the theme. The woocommerce feature is available to this one of the most attractive simple blogger templates. 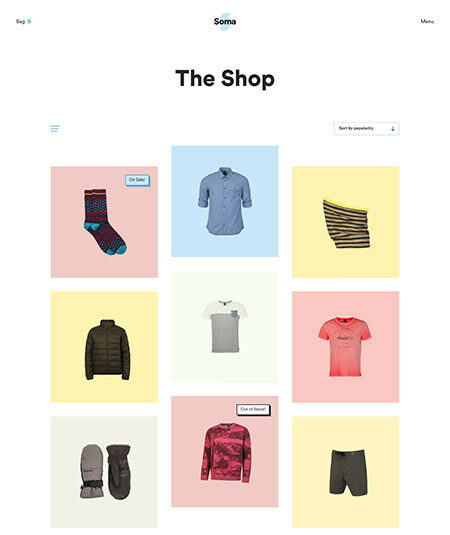 Users can set up their shop page on their website using woocommerce system. There is a one-click demo installation that is very quick and easy for the users. There is a drag and drop builder and a powerful theme option available in this minimal clean blogger template. Also, a lot of features are available in the theme. A supporting team is always ready to help the users. So if you are a professional photographer, seline is the best theme for you. 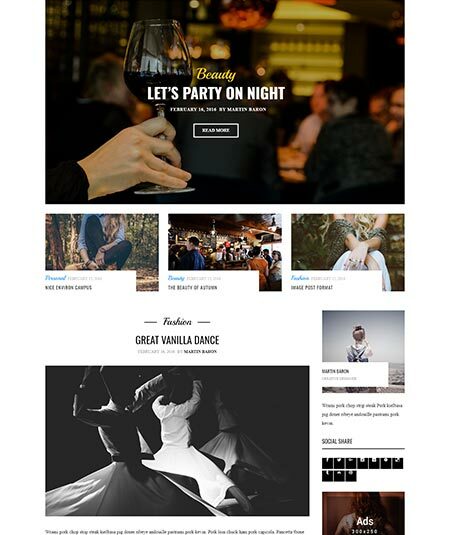 Belinni is an attractive blog and magazine wordpress theme for the bloggers. The theme can be used in all sorts of screens. The theme is very easy to use because it requires no coding knowledge. The theme has 9 pre-designed demos with a one-click installation system. That means it’s very to setup the theme. Besides the theme is very quick, takes no time for loading pages and others contents. This white minimalist blogger template has 8 slider designs, 9 header styles, and 800+ google fonts. So the users can design their website fluently. Also, the woocommerce plugins help the users to create their own shop. They can sell various products easily using this theme. Instagram feed, about me, Facebook, MailChimp, latest post and many other widgets are also available in this one of the greatest minimal blogger templates. Also, a lot of features are available. They provide regular updates for free. So a blogger’s perfect choice can be belinni. Bloggers looking for a ghost blogging theme for their website, sente comes with an attractive theme for them. The theme is very easy to customize and suitable for all sorts of displays such as mobile, laptop or desktop. The theme allows for sharing the posts with social sites such as Facebook, twitter, and google+. Also, the theme has valid W3C and valid HTML5. This attractive white minimalist blogger template is very easy to customize. They give a great guide to the user about all the setup. Adding content or others theme based addition is also really easy. All the information about blogs and tags are well arranged. So the visitors get charmed visiting the website. There are some good features those are really helpful for the bloggers. Lightweight and minimal, masonry grid layout, custom tags page, related post etc. are the main features. A good supporting is always available for the users. 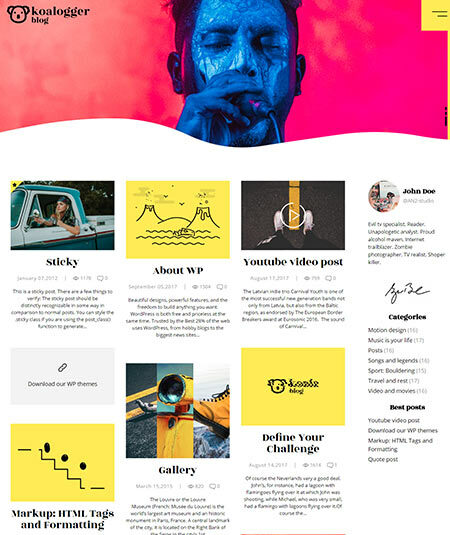 So don’t wait, get this one of the coolest minimal blogger templates sente and run your website smoothly with joy..
Minara is a perfect wordpress minimal theme for the bloggers who are creating a website about magazine. Minara has 3 attractive magazine styles and 9 blog layouts. So there are many choices for the users to decorate their website. There are 600+ google fonts and unlimited color options. Users can change the colors as their taste and font layouts are also changeable from header to footer. Adding or removing content is very easy to do. There are some useful widgets. Newsletter, recent post, popular post, social icons etc. are the main widgets. 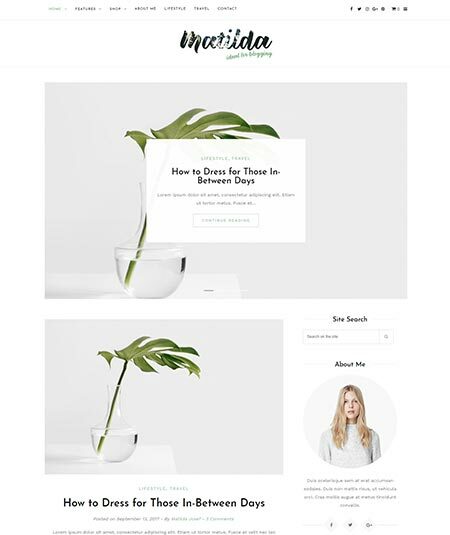 This great white minimalist blogger templates is fit with all kinds of screen. The theme saves a big time of the users. The bloggers can add audio, video, images to their content to make the website more attractive. A lot of features advantage are also there. Besides regular update system is also available with a reliable supporting team. 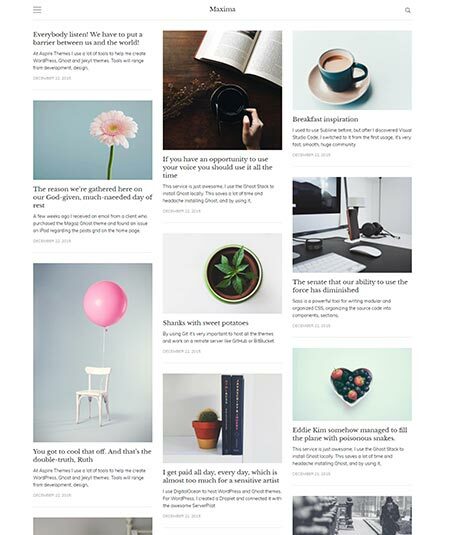 So Minara is a perfect minimal blogger templates about magazine to buy. Amazing Helpfull Artice Written. I am very much glad to read your article.